One of the biggest complaints about digital distribution is how video game prices are not falling. Retail shops, discs, manual, and boxes are all being cut out from the process, and yet we are still coughing up the same $59.99 price we've been trained into blindly accepting. Publishers and console developers obviously want you to buy digitally because the profits are bigger, but they have yet to catch on that some gamers would rather hold a box in their hands if there is no difference in price. Nintendo is going to be the first of the three major console developers to catch onto this revelation, it seems. 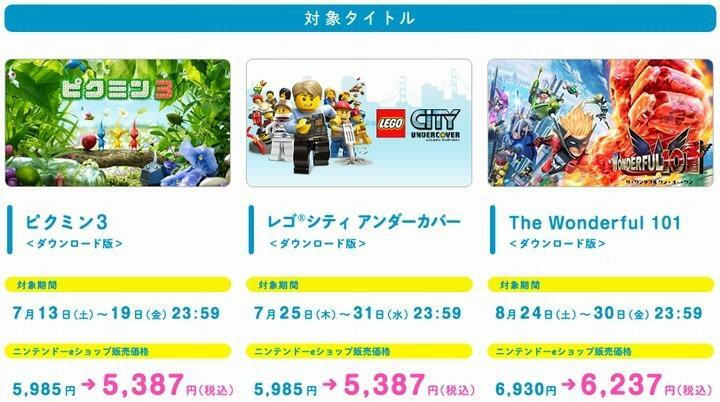 In Japan at any rate, the Nintendo eShop is slashing prices on the summer's biggest Wii U games: LEGO City: Undercover, The Wonderful 101 and Pikmin 3. Prices are being dropped by 10 percent, making it a discount of around a 700 yen ($7). That's cheaper than a used game at GameStop, by the way. Granted, these slashed prices will be available only for the first week of purchase, but the money is going 100 percent to Nintendo and its developers with no middle man in-between, exactly what loud mouth publishers and developers have been clamoring for these days. With any luck, Nintendo of America will show a similar interest in dropping the prices of digital games during their first week of availability as a sign of good faith for the future of digital games. Who knows, maybe Sony and Microsoft might even catch on, but that's not likely.